Based in London | Available for Performances Worldwide. Recently seen performing LIVE on Channel 4’s ‘The Last Leg’, Since 2002 Martin has performed over two thousand shows worldwide as a Professional London based Magician performing Comedy Stage / Cabaret Magic & Close-up Magic in the UK, over 50 countries, as a 5 year Resident Close-up Magician in Spain and on over 100 Cruise Ships! Stage Magic or Cabaret Magic is often requested for Weddings, Corporate Events, Hotel Events, Christmas Party Entertainment, Bar Mitzvah’s, Charity Fund Raisers & many more different event types. Now based in London, Martin travels to perform at corporate and other events all over the UK & worldwide. Having performed his comedy stage magic act to small audiences of 50, large cruise ship theatres of 1500 & recently to a corporate event of over 4000 people in India, whatever your requirements Martin can work with you every step of the way. What can you expect to see in the show? After watching the sample video will have a good idea! 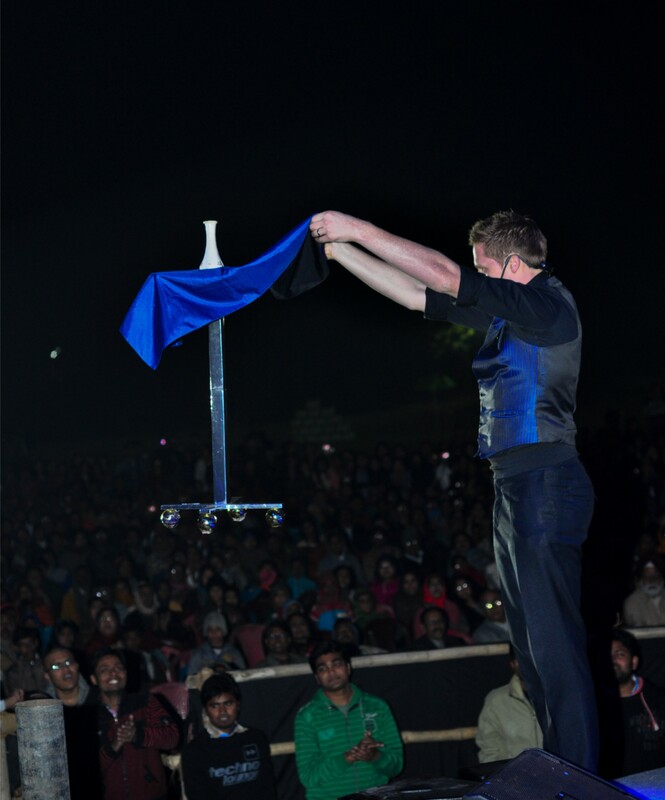 Martin will spellbound you with his visual magic productions…parasols appear from thin air, silks turn into canes and a metal table will seamlessly levitate around the room and over the heads of the audience! Witness the outcome of a trick that ‘apparently’ needs no rehearsal, followed by a 4 year in the making routine inspired by his great grandfather! With a unique talent to combine magic with comedy, you are guaranteed a fun packed night of entertainment. Just wanted to say a quick thank you for such an entertaining night! Great magic and it was just the icing on the cake having our CEO up for the comedy jacket routine!! Thank you and wishing you all the very best for the future. Fantastic Show Martin. Everyone is still amazed with the floating table at the end! Thank you again and we will be highly recommending you. We Will Be Highly Recommending You. Amazing night with a great mixture of comedy and magic which was enjoyed by all. Thank you Martin! Absolutely fantastic! The stage magic was perfect for everyone to watch and get involved and the close-up magic around the tables and groups topped it off perfectly. Just what we wanted for our wedding anniversary hog roast! Thank you Martin. What event types is Stage Magic suitable for? Stage Magic involves putting on a more elaborate show than Close-Up Magic. It is suitable for a variety of events, including but not limited to: Corporate Events, Hotel Evening Entertainment, Wedding Evening Receptions, Product Launches, Trade Shows, Christmas Party Events, Bar Mitzvah, Bat Mitzvah, Gala Dinners, Jewish Weddings. Audience participation plays a massive part in Martin’s shows. Having members of the audience joining in with routines always adds a huge impact to any show. A spectators mind is attempted to be read…ridiculously! Finding a lady’s selected card doesn’t quite go to plan and an audience member is made into an ‘Instant Magician!’ getting the chance to perform in front of the entire audience…particularly good for the CEO of a company, a celebrity or the organiser of the event. Martin began his career and still performs to date as a Professional Close-up Magician. At the age of 21 he became the resident magician at the prestigious 2000 seater Benidorm Palace for five years performing close-up magic on spotlight, table to table in front of audiences of over 1000 nightly! Recognising his talent, the Benidorm Palace offered Martin a spot on the stage, which he accepted by developing and performing a double-act dove and parrot magic act, followed by flying to Las Vegas in 2006 to purchase a Lear Jet Aeroplane to make magically appear on the stage, now known as the World’s largest stage appearance! Gaining a large amount of experience in visual stage magic, Martin decided it was time to develop two full shows coupling visual magic with comedy, which proved a huge success. At the age of 25 he was approached by various cruise lines, where he baffled and brought laughter to audiences performing his Close-up & Comedy Stage Magic shows for a further 5 years! At 32 years old, Martin is now based in London performing at weddings, corporate events & parties around the country. Magician in London - Bexley, Brent, Bromley, Camden, City of London, Croydon, Ealing, Enfield, Greenwich, Hackney, Hammersmith & Fulham, Haringey, Harrow, Havering, Hillingdon, Hounslow, Islington, Kensington & Chelsea, Kingston upon Thames, Lambeth, Lewisham, Merton, Newham, Redbridge, Richmond upon Thames, Southwark, Sutton, Tower Hamlets, Waltham Forest, Wandsworth, Westminster. Martin also performs his Magic Act’s all throughout the UK: Avon, Bedfordshire, Berkshire, Borders, Buckinghamshire, Cambridgeshire, Central, Cheshire, Cleveland, Clwyd, Cornwall, County Antrim, County Armagh, County Down, County Fermanagh, County Londonderry, County Tyrone, Cumbria, Derbyshire, Devon, Dorset, Dumfries and Galloway, Durham, Dyfed, East Sussex, Essex, Fife, Gloucestershire, Grampian, Greater Manchester, Gwent, Gwynedd County, Hampshire, Herefordshire, Hertfordshire, Highlands and Islands, Humberside, Isle of Wight, Kent, Lancashire, Leicestershire, Lincolnshire, Lothian, Merseyside, Mid Glamorgan, Norfolk, North Yorkshire, Northamptonshire, Northumberland, Nottinghamshire, Oxfordshire, Powys, Rutland, Shropshire, Somerset, South Glamorgan, South Yorkshire, Staffordshire, Strathclyde, Suffolk, Surrey, Tayside, Tyne and Wear, Warwickshire, West , Glamorgan, West Midlands, West Sussex, West Yorkshire, Wiltshire, Worcestershire. & visual comedy magic stage show like no other! Request a Quote now for Martin to perform as a London Magician or for any Event UK Wide on 07564 032857 or alternatively, Click Here to E-mail Martin. Magic Night! Thursday April 3rd – Apatura International Bar Restaurant & Grill, Croydon. Magic Night! At Apatura Restaurant, Croydon. Now a member of the World’s Largest Entertainment Booking Website!